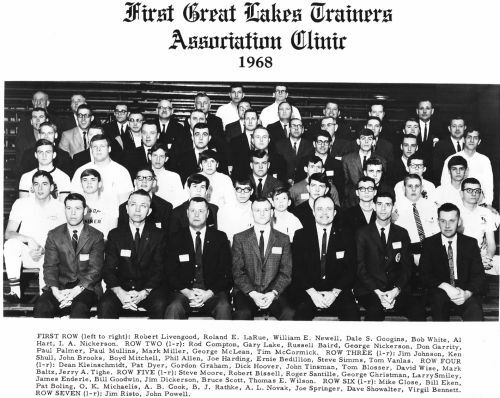 Since 1950 when NATA and District 4, the Great Lakes Athletic Trainers' Association, was established, we have been promoting and advancing the profession. We are proud of our history and look forward to an exciting future. The NATA is established. The first national meeting is held in Kansas City, Missouri. The NATA - District 4, Great Lakes Athletic Trainers’ Association, is established. Al Sawdy, Bowling Green State University, served as the first District Director. District 4 was created with the addition of Illinois, Indiana, Michigan, Ohio, and Wisconsin along with the University of Iowa. The NATA annual meeting is held on Miami University's Oxford, Ohio campus, June 17-20. Athletic Trainer, Jay Colville, hosted. Robert “Bob” Weingart, Marquette University, is elected chairman of the NATA Board of Directors. Tom Healion, Northwestern University, is elected chairman of the NATA Board of Directors. Tom Healion, Northwestern University, elected to second term as Chairman of the NATA Board of Directors. The NATA Constitutional change allows each district to govern its own membership. The district oversees the appointment of the District Director along with a new position of District Secretary, first served in District 4 by Roland “Duke” LaRue of Western Illinois University. District 4 hosts the NATA national meeting in Chicago, Illinois. Dorothy “Dot” Cohen, graduate of Indiana University, was the first woman to join the NATA. District Constitution written in Ohio by Dale Googins from Denison University and Gary Lake, Student Athletic Trainer from Denison University. First GLATA Annual Meeting is held in Ohio at Denison University in March. Dale Googins presides over the first meeting and Gary Lake, a student at Denison, is appointed Secretary because Roland “Duke” LaRue, from Western Illinois University in Macomb, is not able to make the meeting due to an ice storm. The GLATA Annual Meeting is held at Western Illinois University, Macomb, Illinois. The GLATA Annual Meeting is held at Western Michigan University; Jack Jones, serves as the host Athletic Trainer. Five women are granted NATA certification under a grandfather clause. Holly Wilson Greene, Indiana State University, is from District 4. The GLATA Annual Meeting is held at the University of Wisconsin, Madison, Wisconsin. GLATA ‘s fifth meeting anniversary is held at Valparaiso University, Valparaiso, Indiana. The NATA realigns the districts, effective in 1973. District 4 will include Illinois, Indiana, Michigan, Minnesota, Ohio, Wisconsin, Marshall University in West Virginia and the Canadian Provinces of Manitoba and Ontario. The NATA Board of Directors institutes a column in the Journal of Athletic Training designated for women. The first article written is by Holly Wilson Green (June, 1973) entitled “Not for Men Only.” The column is discontinued in 1976. A District Constitution and Bylaws Committee is appointed and charged with revising the documents to co-inside with the NATA Constitution and Bylaw. The GLATA Annual Meeting is held in Minneapolis-St. Paul, Minnesota. Five women (Marje Albohm, Linda Weber Daniel, Linda Treadway Dillmon, Gail Weldon, and Maryann Zickler) from District 4 earn NATA Certification. The GLATA Annual Meeting is held in Merrillville, Indiana. The NATA Board of Directors appoints an ad hoc committee, Women in Athletic Training. Holly Green serves as chair and District 4 members Marje Albohm (Indiana University), Linda Treadway Dillmon (Central Michigan University) and Gail Weldon (Indiana State University/Western Michigan University) serve on the committee. Holly Green authors the first athletic training textbook specifically for women entitled Workbook: Fundamentals of Athletic Training for Women. The GLATA Annual Meeting is held in Ann Arbor, Michigan. GLATA establishes a Living Memorial Scholarship. Marje Albohm is elected as the first female Secretary-Treasurer. GLATA’s 10th Anniversary Annual Meeting is held in MaComb, Illinois, at Western Illinois University. The GLATA Winter Meeting is held in Perrysburg, Ohio. The GLATA Annual Meeting is held in Kalamazoo, Michigan. District 4 brought forth to the NATA Board of Directors a proposal to re-district the NATA. The GLATA Winter Meeting is held in LaCrosse, Wisconsin. The GLATA Annual Meeting is held in Indianapolis, Indiana. GLATA establishes the Annual Meeting Planner position. The GLATA Annual Meeting is held in Akron, Ohio. The GLATA Annual Meeting is held in Schaumburg, Illinois. GLATA approves an initial licensure grant concept in the amount of $1,000.00. The GLATA Winter Meeting is held in Merrillville, Indiana. The GLATA Annual Meeting is held in Rochester, Minnesota. Illinois Registration Law is enacted by the State General Assembly. GLATA’s 20th Anniversary Annual Meeting is held in Grand Rapids, Michigan. District 4 brings forth a motion to NATA Board of Directors that a full time NATA Executive Director be retained prior to the national office relocation. The NATA establishes a High School Athletic Trainer Committee. District 4 member, Hal Hilmer from Arlington Heights, Illinois, is appointed chairperson. GLATA revises the scholarship guidelines and establishes a scholarship selection committee under the leadership of Vice-President Wayne Vaupel. The William ”Pinky” Newell lecture is established with the assistance of Jim Viola from Johnson & Johnson Company. The Licensure Grant Committee is established. The GLATA Annual Meeting Annual is held in Green Bay, Wisconsin. GLATA establishes the Living Scholarship Fund and Research Assistance Projects. GLATA establishes a written Policy and Procedure Manual for the Executive Council. GLATA voted to increase dues by $10.00. The GLATA Annual Meeting is held in Toledo, Ohio. The American Medical Association (AMA) endorses Athletic Training as an Allied Health profession. Pro Orthopedic Devices, Inc. becomes a sponsor of the GLATA Newsletter. The GLATA Annual Meeting is held in Rosemont, Illinois. GLATA Executive Council begins long term strategic planning. GLATA’s 25th Anniversary Annual Meeting is held in Indianapolis, Indiana. Steve Risinger serves as the host athletic trainer. GLATA’s Continuing Education Needs Assessment project is developed. Dennis A. “Denny” Miller, Purdue University, is elected President of the NATA. Former GLATA Secretary / Treasurer Pat Troesch gathers historical documents and memorabilia. The GLATA Annual Meeting is held in Dayton, Ohio. GLATA submits a constitutional change to split the office of Secretary- Treasurer into two separate positions. The GLATA Annual Meeting is held in Detroit, Michigan. GLATA establishes a Finance Committee to restructure GLATA finances. Denny Miller, Purdue University, is elected to serve a second term as President of NATA. The GLATA Annual Meeting is held in Ft. Wayne, Indiana. The NATA Board of Directors appoints a task force on Women in Athletic Training with Katie Grove (Indiana University) serving as Chairperson. District 4 members Cynthia “Sam” Booth (Minnesota) will serve as the NATA Liasion and Gretchen Schlabach (Illinois) will be the District 4 Representative on the task force. The GLATA Annual Meeting is held in Madison, Wisconsin. Cynthia “Sam” Booth serves as the first woman District 4 Director. Kent P. Falb, Detroit Lions, is elected President of the NATA. The NATA Board of Directors (BOD) votes to change the Women in Athletic Training Task Force name to the Women in Athletic Training Committee. Katie Grove continues to serve as Chairperson. GLATA establishes a website. Patrick Sexton is appointed the first webmaster. The GLATA 30th Anniversary Winter Meeting is held in Bloomington, Minnesota. The GLATA Annual Meeting is held in St. Charles, Illinois. Kent P. Falb, Detroit Lions, is elected to a second term as President of NATA. The NATA Hall of Fame Inductees: Marjorie J. Albohm, Kent P. Falb and Dale Googins. The GLATA Annual Meeting is held in Milwaukee, Wisconsin. GLATA Executive Council approves an Honors and Awards Program. The GLATA Annual Meeting is held in Columbus, Ohio. The first GLATA Honors and Awards Ceremony takes place at the meeting. The GLATA Annual Meeting is held at Evansville, Indiana. GLATA approves a History and Archives position. The GLATA Annual Meeting is held in Chicago, Illinois. GLATA’s first class of Student Senators attend the meeting. Roger Kalisiak is appointed the first chairperson of History & Archives Committee. David Bazzett-Jones, first Chair of Student Senate, is appointed to serve as a member of the GLATA Executive Council. GLATA appoints an Education Task Force. GLATA E-Blasts are started as a means of member communication. Shari Bartz Smith is appointed GLATA Education Committee Chairperson. Michigan is final state to achieve state regulation (licensure). Michael Doyle, IN appointed to NATA Committee on Revenue. Alex Wong, OH appointed to NATA Career Assistance Committee. Bill Pitney, IL appointed to NATA Education Council, Learning Communities Subcommittee. GLATA’s 40th Anniversary Winter Meeting is held in Toledo, Ohio. Roger Kalisiak and Marion Vruggink produce a celebration and history DVD to commemorate the occasion. Marjorie Albohm, MS,ATC, is elected NATA President. She is the second female to hold the position. GLATA Executive Council undertakes revision of Constitution and Bylaws. GLATA Annual Meeting held in Detroit, Michigan. GLATA Annual Meeting held in Minneapolis, Minnesota. NATA President Marje Albom addresses membership. University of Indianapolis winners of Quiz Bowl. GLATA Annual Meeting held in Wheeling, Illinois. Pinky Newell Lecture by Ralph Reiff, "Model the way"